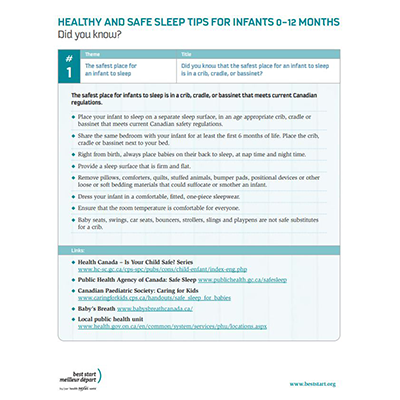 This series of 7 Infant Sleep Messages provide tips and practical suggestions for parents and caregivers of infants aged 0-12 months on healthy and safe sleep. The tips support the current recommendations on how to reduce the risks of Sudden Infant Death Syndrome (SIDS) and other sleep-related causes of infant death. These messages are consistent with the information provided in the Sleep Well, Sleep Safe booklet (in English and French). Share the tips through your Facebook pages. Print the documents and use them as handouts. Use the text in your parent newsletters. Attachment and sleep : Did you know that your infant needs your loving care to better develop healthy sleep habits? Creating safe sleep environments: Did you know that creating safe sleep environments will reduce the risks of infant death? Breastfeeding and Sudden Infant Death Syndrome: Did you know that breastfeeding reduces the risks of SIDS? Alcohol/drug misuse and Sudden Infant Death Syndrome: Did you know that avoiding alcohol and drug misuse can reduce the risk of infant death? Smoking and Sudden Infant Death Syndrome: Did you know that preventing exposure to tobacco smoke, during pregnancy or after pregnancy, reduces the risk of SIDS?